Ryan Norris pitches out of trouble in the sixth inning and finishes a complete-game win as Gorham earns the shot to face four-time defending champ Bangor. STANDISH — How does a team that was once barely over .500 make it to the Class A baseball championship? In Gorham High’s case, the Rams were consistently being “a team that was difficult to beat,” as Coach Chuck Nadeu put it, and then tapped into an unknown source of pitching. Senior right-hander Ryan Norris continued his unlikely success story on Tuesday with a complete-game, five-hit, 3-2 victory against No. 2 Cheverus in the Class A South regional final at St. Joseph’s College’s Larry Mahaney Diamond. The No. 2 Rams (15-4), winners of 10 straight games, earned their first trip to the Class A baseball championship. Gorham won Class B titles in 1998 and 2005. 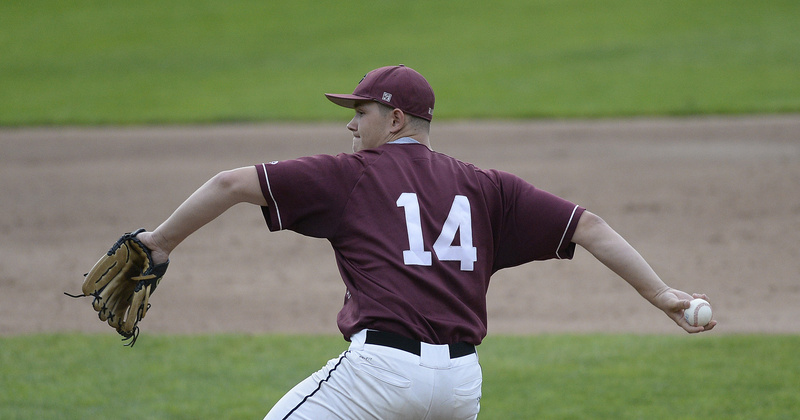 Gorham pitcher Ryan Norris delivers a pitch in Tuesday’s game. He threw a complete-game five-hitter for the Rams. By keeping his pitch count well below the 95-pitch cutoff (he threw 81), Norris is eligible to come back on three days’ rest for the 1 p.m. Saturday state final against four-time champion Bangor (18-1, at St. Joseph’s College’s. “I want the start. I definitely want the start,” Norris said. Norris had pitched sparingly at the varsity level until making his first career start in Gorham’s eighth game of the season. He is now 6-0 with a pitch-to-contact style, having allowed just 25 hits and five walks in 42 innings. “In the beginning of the season I wasn’t throwing too well but once I figured it out, figured out my windup and my curveball, I started to throw really well. My starts definitely helped the team, hopefully,” Norris said. Norris cruised through five innings in 53 pitches, allowing two singles, as Gorham built a 3-0 lead on a pair of two-out doubles. Lucas Roop drove in David Drew (2 for 3) and Ben Nelson in the third with a shot to the left-field corner, after a key single by Kyle King on an 0-2 count loaded the bases against Cheverus starter Conner MacDonald (4.2 innings, five hits, three earned runs). Gorham players swarm pitcher Ryan Norris, far left, after Gorham’s win over Cheverus. Trevor Loubier made it 3-0 in the fifth when he blasted a MacDonald curve to the fence in left, allowing Brogan McDonald to score from first. But Cheverus (13-6), which won 12 of 13 after its 1-4 start, wasn’t going quietly. The Stags had shown they could rally late in playoff games. They had scored eight in the sixth inning to put away pesky Deering 11-1 in the quarterfinal and two in the seventh for a walk-off 5-4 semifinal win against Falmouth. In the sixth, Cheverus mounted a two-run rally, started by an infield-chop single by Quinn Watson. Norris hit Cam Dube with a pitch and Justin Ray’s hard-hopper single got through up the middle to score Watson. Norris helped himself by snagging a tough one-hopper up the middle and getting a force at third for the first out. 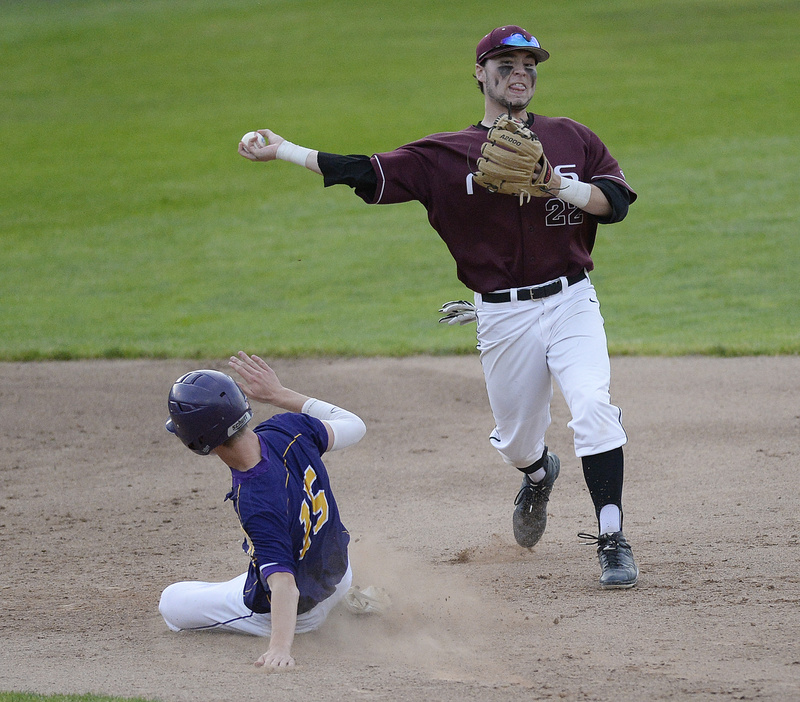 Gorham’s William Prescott attempts to turn a double play as Jack Mullen of Cheverus slides into second base. “We had run that play multiple times through practice so I knew what I had to do, just grab the ball, throw to third and get the out,” Norris said. But with two outs and an 0-2 count, Hayden O’Donnell stroked a hard single to right to score Ray. Gorham right fielder David Drew reacted quickly, with a strong relay throw to shortstop Ben Nelson, who threw out Andrew DeGeorge at third to end the inning. Facing the bottom of Cheverus’ order in the seventh, Norris returned to his strike-throwing ways, needing only nine pitches for a 1-2-3 inning. 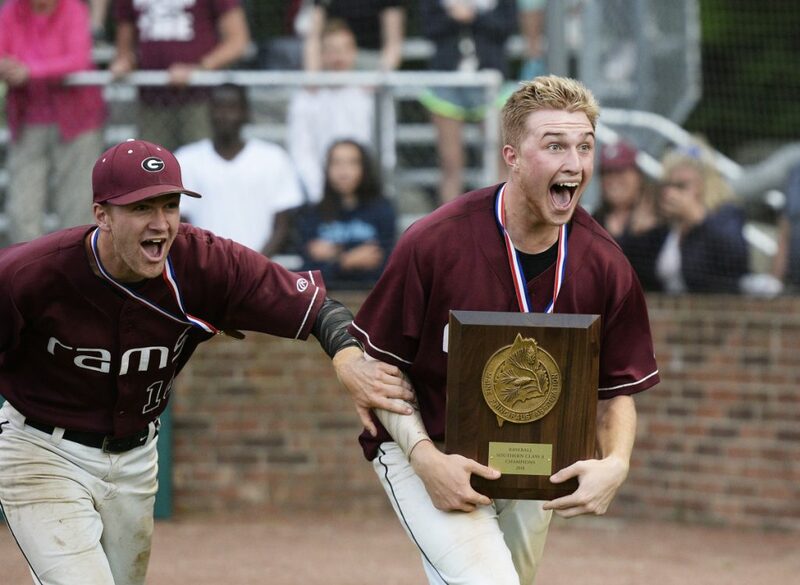 Gorham’s two previous baseball titles came in Class B crowns in 1998 and 2005.